Is it true that hunter-gatherers were peaceful egalitarians? The answer is yes. If just one anthropologist had reported this, we might assume that he or she was a starry-eyed romantic who was seeing things that weren't really there, or was a liar. But many anthropologists, of all political stripes, regarding many different hunter-gatherer cultures, have told the same general story. ... One anthropologist after another has been amazed by the degree of equality, individual autonomy, indulgent treatment of children, cooperation, and sharing in the hunter-gatherer culture that he or she studied. 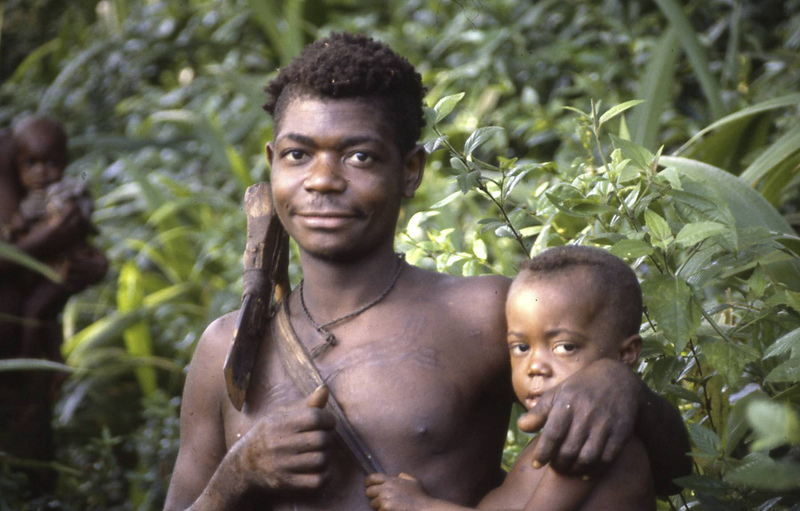 During the twentieth century, anthropologists discovered and studied dozens of different hunter-gatherer societies, in various remote parts of the world, who had been nearly untouched by modern influences. Wherever they were found - in Africa, Asia, South America, or elsewhere; in deserts or in jungles - these societies had many characteristics in common. The people lived in small bands, of about 20 to 50 persons (including children) per band, who moved from camp to camp within a relatively circumscribed area to follow the available game and edible vegetation. The people had friends and relatives in neighboring bands and maintained peaceful relationships with neighboring bands. Warfare was unknown to most of these societies, and where it was known it was the result of interactions with warlike groups of people who were not hunter-gatherers. In each of these societies, the dominant cultural ethos was one that emphasized individual autonomy, non-directive childrearing methods, nonviolence, sharing, cooperation, and consensual decision-making. Their core value, which underlay all of the rest, was that of the equality of individuals. We citizens of a modern democracy claim to believe in equality, but our sense of equality is not even close that of hunter-gatherers. The hunter-gatherer version of equality meant that each person was equally entitled to food, regardless of his or her ability to find or capture it; so food was shared. It meant that nobody had more wealth than anyone else; so all material goods were shared. It meant that nobody had the right to tell others what to do; so each person made his or her own decisions. It meant that even parents didn't have the right to order their children around. It meant that group decisions had to be made by consensus; hence no boss, "big man," or chief. The writings of anthropologists make it clear that hunter-gatherers were not passively egalitarian; they were actively so. Indeed, in the words of anthropologist Richard Lee, they were fiercely egalitarian. They would not tolerate anyone's boasting, or putting on airs, or trying to lord it over others. Their first line of defense was ridicule. If anyone - especially if some young man - attempted to act better than others or failed to show proper humility in daily life, the rest of the group, especially the elders, would make fun of that person until proper humility was shown. On the basis of such observations, Christopher Boehm proposed the theory that hunter-gatherers maintained equality through a practice that he labeled reverse dominance. In a standard dominance hierarchy - as can be seen in all of our ape relatives (yes, even in bonobos) - a few individuals dominate the many. In a system of reverse dominance, however, the many act in unison to deflate the ego of anyone who tries, even in an incipient way, to dominate them. This is my own theory, which I introduced two years ago in an article in the American Journal of Play. Briefly, the theory is this. Hunter-gatherers maintained their egalitarian ethos by cultivating the playful side of their human nature. Social play - that is, play involving more than one player - is necessarily egalitarian. It always requires a suspension of aggression and dominance along with a heightened sensitivity to the needs and desires of the other players. Players may recognize that one playmate is better at the played activity than are others, but that recognition must not lead the one who is better to lord it over the others. My play theory of hunter-gather equality is based largely on evidence, gleaned from analysis of the anthropological literature, that play permeated the social lives of hunter-gatherers - more so than is the case for any known, long-lasting post-hunter-gatherer cultures. Their hunting and gathering were playful; their religious beliefs and practices were playful; their practices of dividing meat and of sharing goods outside of the band as well as inside of the band were playful; and even their most common methods of punishing offenders within their group (through humor and ridicule) had a playful element. By infusing essentially all of their activities with play, hunter-gatherers kept themselves in the kind of mood that most strongly, by evolutionary design, counters the drive to dominate others. One esteemed contemporary researcher who has implicitly if not explicitly supported the parenting theory of hunter-gatherer moral development is Darcia Narvaez, author of the blog 'Moral Landscapes'. It is difficult to prove with empirical evidence that the kindly, trustful parenting of hunter-gatherers promotes development of people who treat one another kindly and who eschew aggression, but the theory makes intuitive sense. It makes sense that infants and children who are themselves trusted and treated well from the beginning would grow up to trust others and treat them well and would feel little or no need to dominate others in order to get their needs met. The childrearing theory overlaps with my play theory, because hunter-gatherers allowed their children, including teenagers, to play essentially from dawn to dusk. The children grew up believing that life is play and then went on to conduct esssentially all of their adult tasks in a playful mood - the mood that counters the drive to dominate. Lee, R. B. (1988). 'Reflections on primitive communism'. In T. Ingold, D. Riches, & J. Woodburn (Eds), Hunters and gatherers 1, 252-268 Oxford: Berg. Gray, P. (2009). 'Play as a foundation for hunter-gatherer social existence'. American Journal of Play, 1, 476-522. Thank you for this extremely articulate an helpful article.